Hi Friends! It's been busy around here! I recently went back to work full-time, and have spent the past few weeks adjusting to being a working woman! I have so many fun updates to share with you in the coming weeks of our home so I hope you'll check back! 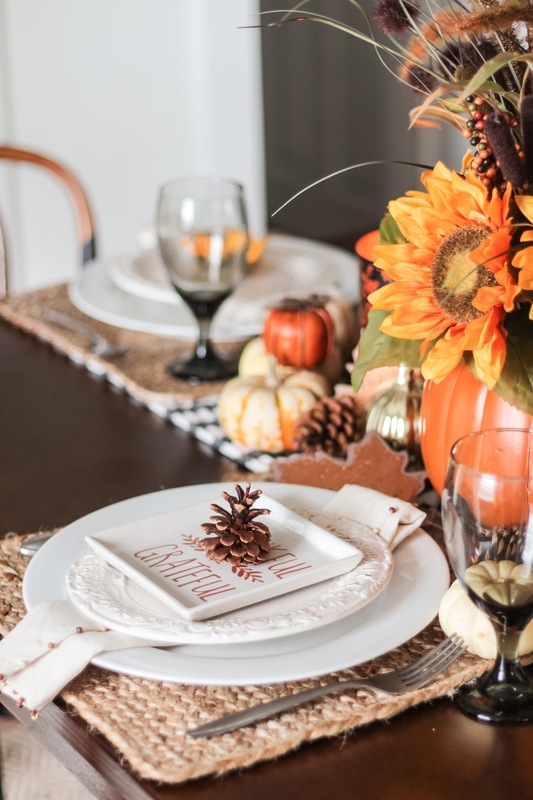 Today, however, I wanted to share with you a last minute Thanksgiving/Fall tablescape. 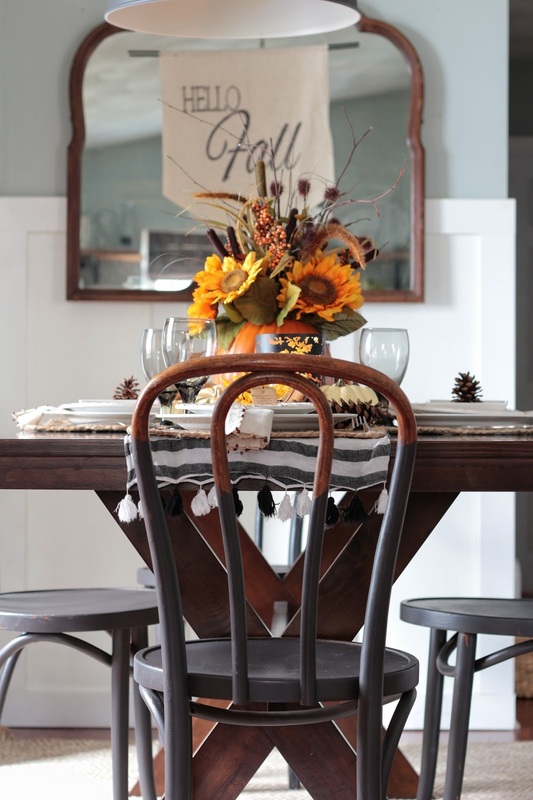 I used many of the items you saw glimpses of in my fall home tour, but this time a little more formal. If I'm being honest, I very rarely set the table . . . in fact, the main reason I wanted to share this post is because we just recently purchased a new, larger dining table . . . one that better suits our family of 6 and I needed a reason to dress it up. The table is a little different from what I was hoping to replace my white PB knock off table with, but we definitely needed more space. 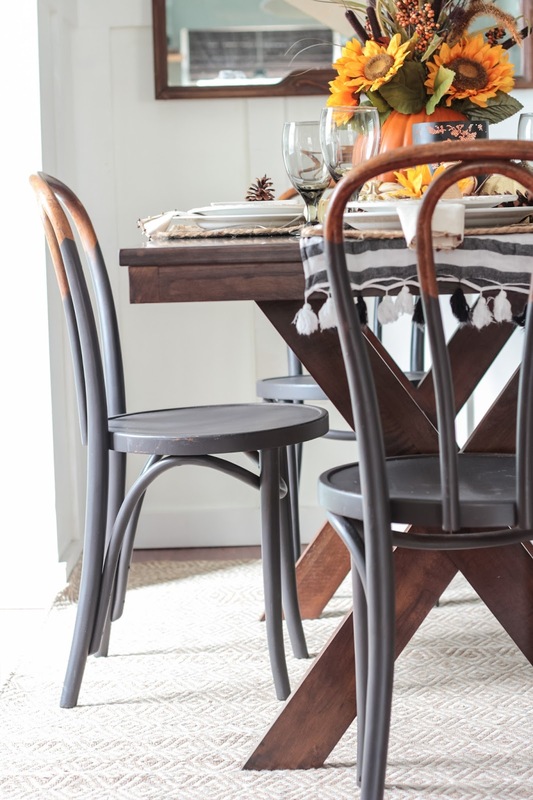 You may also notice that I painted my bentwood chairs (I have an entire post on that process I hope to share soon), The rug I recently purchased from Target to ground the space and break up the wood tones of the table and flooring. 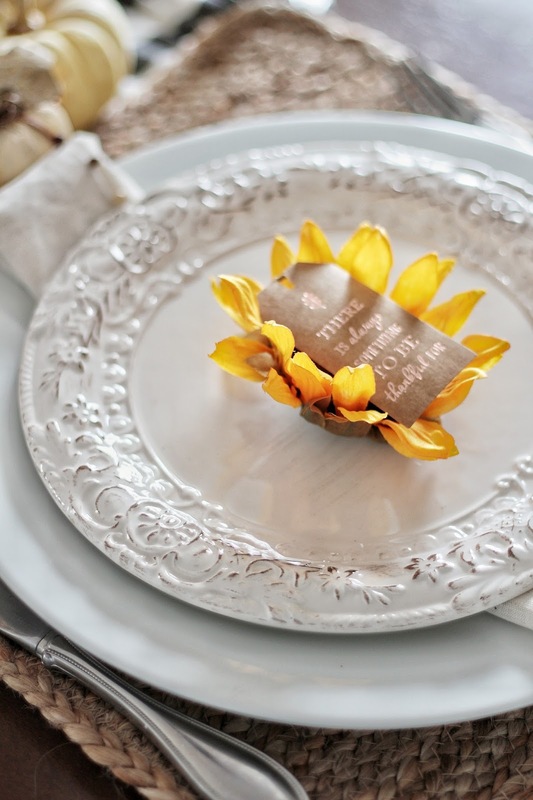 Okay, I'm totally rambling, let's get on to the tablescape! For this tablescape I gathered my favorite black and white striped and tassled tablerunner (which is actually a scarf) some large white plates (the only kind I own), some smaller decorative plates (similar here), My favorite Better Homes and Gardens Natural Jute Place mats, And some Black tinted goblet glasses, purchased from Dollar tree. For the centerpiece, I found this pumpkin floral arrangement at the thrifstore for $4.99. It was quite horrid . . . well it was probably nice at one time. I had to dissect it and make it a bit more my style. I kept to a simpler color scheme and added some picks from the Dollar Tree and some sticks from the backyard . . .
Ahhhh . . .Much Better! I had a few sunflowers leftover, so I plucked them off their sticks and placed them in the center of the salad plates with cute little tags found at Target's Dollar spot. 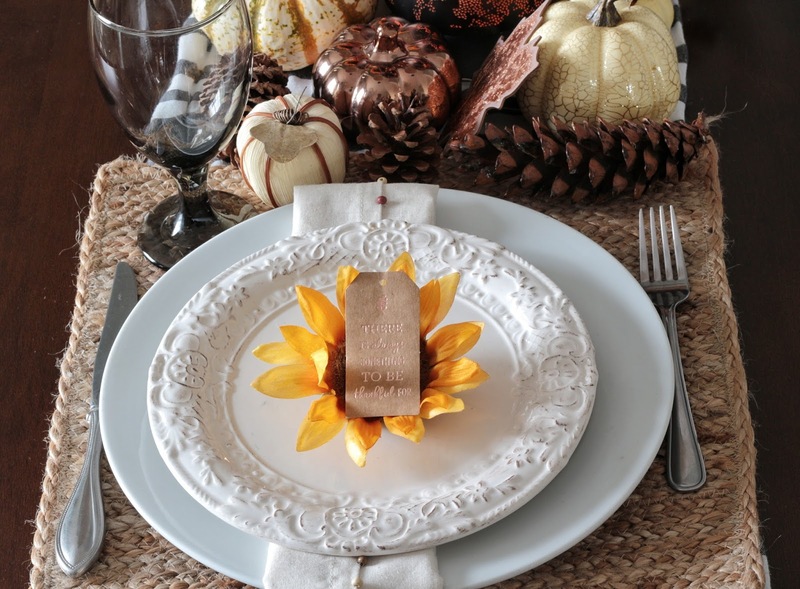 I alternated between the sunflowers and some simple pine cones for the plates. 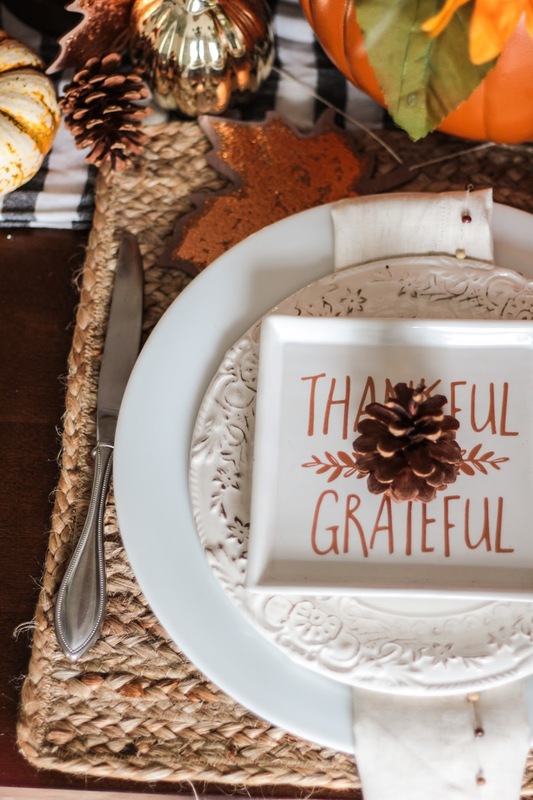 I found these really cute beaded cloth napkins on clearance at Homegoods and I just love the little bit of texture and rustic-ness the wooden beads add to the setting. 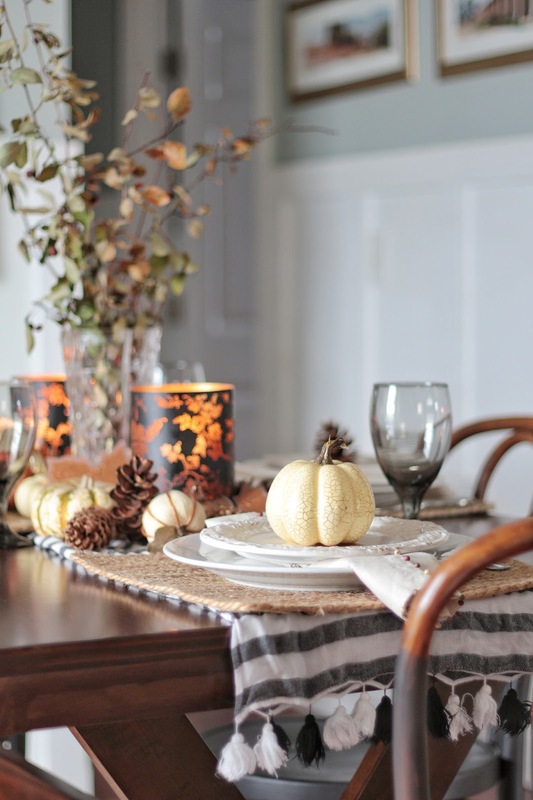 For a tiny bit of glam, I flanked the pumpkin centerpiece with two pierced black and gold candle holders. Next I just filled it all in with a variety of small pumpkins that I had on hand. All kinds: real, fake, metallic, dull, you name it, I filled them in. I also added some pine cones small and large, and some wooden leaves from the Dollar spot as well. And that's it friends! I'm so glad to finally have a place where we can all sit comfortably as a family again! I hope you all have a wonderful Thanksgiving filled with good friends, family and Great Food! 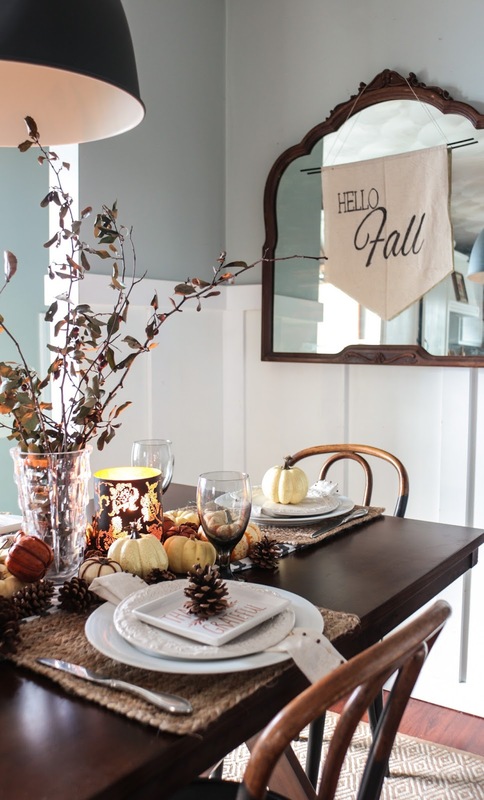 Carli I love your tablescape! So simple and chic! The sunflower idea is so cute! I'll be using that in the future! Carli, I love how you set up all the pumpkins on the table and how each setting is a bit different. So pretty! 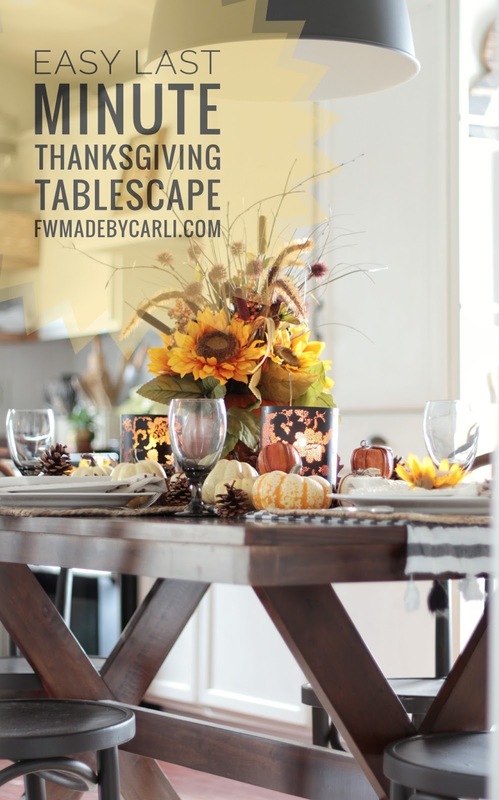 Carli, your tablescape is fantastic! 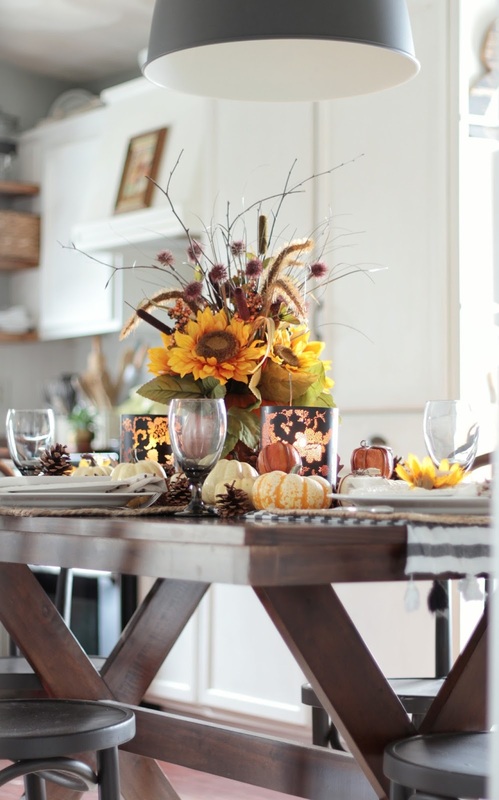 Love the centerpiece! You're new chairs are so gorgeous!!! The one room challenge left me scrambling for Christmas so no fancy tablescapes for me this year, but I'll link last years!